On the warm spring day when Babette Gallard and Paul Chinn decided to ride 1600 kilometres along the St James Way to Santiago de Compostela in Spain, he had never ridden before, she had only ever ridden under duress, their horses had yet to be found and the dog was a passing whim they were trying to forget. "Riding the Milky Way" tells the story of their journey. The humans were broke, burnt-out and vaguely hoping that early retirement would save their health and sanity. The horses were plucked off the equine scrap heap in France and still grappling with their new roles as something between mount and mountain goat. The dog was doing his best to understand why he was there. 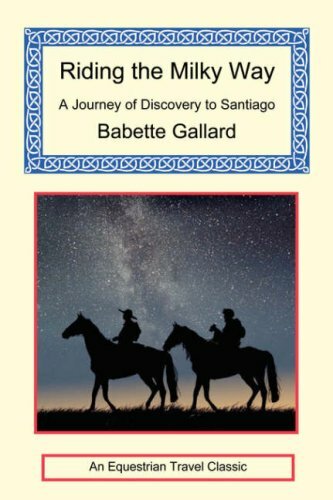 This inspiring, amusing and informative book sweeps the reader along with each member as he or she, horse or dog, progresses step by step towards a goal that has become more than just Santiago. The author not only explains how to avoid the pitfalls they encountered but also tells the reader what is expected of riders making this ancient pilgrimage. Packed with sketches and photographs, this book will inspire even the most timid traveller, while also giving practical guidance for someone wanting to do a similar journey. Finally, it is much more than just a good read. It is an excellent, if sometimes irreverent, guide to the legendary St James Way.